Six miles from Lake Mead and an easy 55-mile drive from Las Vegas, the Valley of Fire State Park is Nevada's oldest and biggest state park. The park takes its name from fiery sandstone formations, which were formed by shifting sand dunes years ago. The geology here is similar to Red Rock, but the area also offers a glimpse into early Native American cultures. It was frequently visited by the ancient Basket Maker people and Anasazi, who used the area for hunting and religious ceremonies. Excellent examples of their rock art and petroglyphs are found throughout the area. Stop at the visitor center to see exhibits and pick up easy-to-follow directions to climbing, hiking, picnic areas and rest rooms. A favorite scenic drive is to the left of the visitor center heading towards the "White Domes." There is a small entry fee upon entering Valley of Fire State Park. 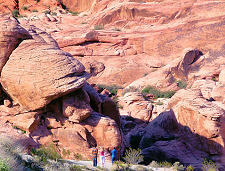 Red Rock Canyon National Conservation Area offers a one-way 13-mile scenic drive, hiking, biking, rock climbing and seasonal camping. A visitor center at the base of the scenic drive offers in-depth information about the area's history, recreation, geology, wildlife and vegetation. You will also find a gift shop and interactive indoor & outdoor exhibitions. There is an entrance fee for the vistor center and scenic drive, and yearly visitor passes are also available for purchase. Please drive safely when exiting back on to the main road of two-way traffic. The conservation area, spanning some 197,000 acres, features colorful sandstone formations, canyons, a spring, and is home to a variety of wildlife including burros, reptiles, birds, desert bighorn sheep in remote areas, and seldom seen bobcats. The wild burros are said to be the descendents of animals used by miners in the early 1900's. Located just down the road from Red Rock is Spring Mountain Ranch State Park. Covering 520 acres, it was once a working ranch and luxury getaway for its series of famous owners, including Howard Hughes. It offers a calendar of events throughout the year. Calico Basin offers a covered picnic area, trails, and a winding boardwalk that brings you face up to beautiful calico colored rocks and boulders. As with any outdoor recreation getaway in southern Nevada, visitors should bring plenty of water and dress for the season. Red Rock Canyon is about a half-hour from the heart of Las Vegas. Head west on Charleston Blvd.